Yesterday the EUR/USD currency pair started moving downwards and broke a local minimum. During a correction, I opened one more sell order. The target is in the area, where there are three fibo-levels. If the price rebounds from these levels, the pair may start a new correction. At the H1 chart, lower border of the target area is near the level of 200% from the previous ascending correction, which finished at the level of 78.6% from the previous descending movement. According to the analysis of temporary fibo-zones, the bears may reach predicted levels by Monday. On Thursday, Franc started moving upwards very fast. Right now, the bulls are slowing down a little bit, and I’ve decided to increase my long position. 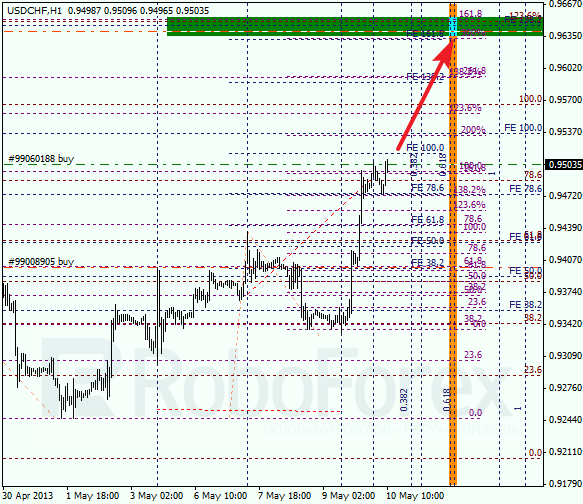 The target area has been moved a bit higher, now it’s the level of 0.9640, where there are five fibo-levels. The bulls are still very strong, that’s why I expect them to start a new ascending movement quite soon. According to the analysis of temporary fibo-zones, the upper levels may be reached in the beginning of the next week.